Are you still looking for a rug to decorate your favorate room? Do you feel tired after a whole day's hard work?If you still can't find a suitable seat cover draped across your couch? 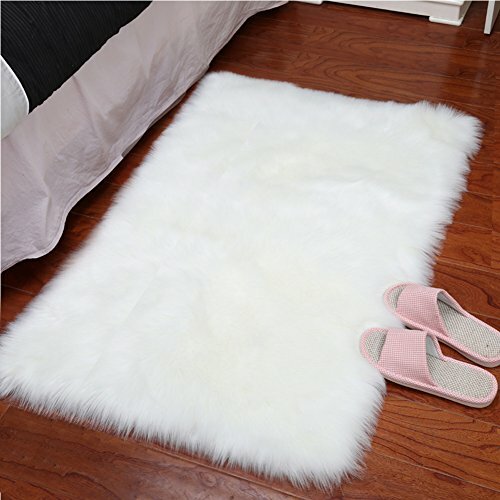 YJGWL high quality warm cozy sheepskin rug will satisfy your any requirement.So what are you waiting for? Soft Touch Feeling -- Environmental protection technology gives faux fur rug safe feature,its excellent elasticity and recovery capability ensure aux fur achieve great texture and hand feeling. Skin-Friendly & No Smell -- Made of high quality artificial animal wool ensure aux fur achieve great texture and hand feeling,no smell and not shed,more skin-friendly to family members. Floor Protection -- Non slip suede backing design is ideal for wooden or other material floor surfaces and it doesn't move at all. Perfect Choice for Home Decor -- White fur rug is a easy way to decorate your living room, bedroom,sofa, or children's room, keep warm during cold winter weathers and great decorative rug for any space. If you have any questions about this product by YJ.GWL, contact us by completing and submitting the form below. If you are looking for a specif part number, please include it with your message.